December 5, 2013, was one of the most memorable days at TEDWomen — and everywhere else in the world, too. The world lost one of its great leaders, Nelson Mandela, and I will never forget the way we heard the news at the TEDWomen gathering in San Francisco. A young South African, Boyd Varty, was scheduled to give his TED Talk that day, and as he came backstage to get miked, the news came through on our phones and computers: Mandela had died. I knew that Boyd and his family were close to him. Mandela had visited the Varty family’s game preserve, Londolozi, on one of his first retreats after being released from his long prison term. I saw the tears well up as Boyd absorbed the sad news. I suggested that we rearrange the schedule so he could take a break and deliver his TED Talk later in the day. But he assured me he was ready to go, and asked if he could mention the news to the audience. Of course, I said yes. Who better than someone who knew him personally to share this tragic news of the passing of the great South African leader admired by the world for leading his country from the violent policies of apartheid through truth and reconciliation trials to the vibrant country that it is today? Boyd stepped on stage into the red TED circle and, his voice shaking, told the audience the news. I was quite worried that he wouldn’t be able to deliver the TED Talk he had prepared to give, but he did brilliantly. In fact, his talk, which was posted immediately on TED.com, has been viewed more than 1.5 million times since. Boyd says he gets emails and comments every day about his TED Talk, and he noticed a theme emerging: an emotional connection people from all over the world were making with his stories about animals and tracking. So he decided to explore how his skills as a highly trained ranger and wildlife tracker might be applied to life tracking. I’m certainly not predicting that this year’s TEDWomen will have such a moment as the one that Boyd Varty shared with us that day, but I can predict that this year’s lineup will yield ideas and TED Talks that will shift perspectives for those present and the millions more who view them on TED.com. Photo credits: (top) Boyd Varty at TEDWomen 2013, courtesy of TED Talks. 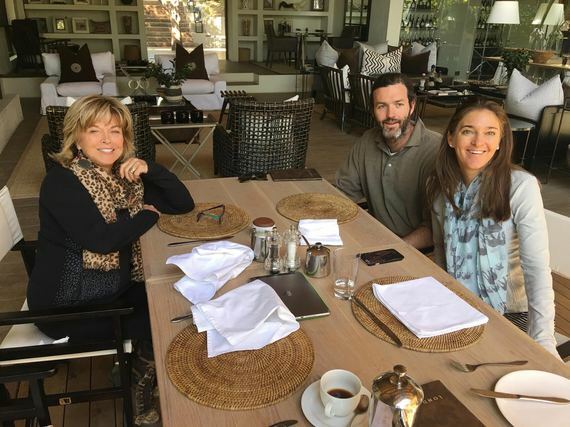 (middle) Pat visiting with Boyd Varty and his fiancée, Joelle Simpson, in South Africa, credit Scott Seydel.